In just under a thousand very large pages and six pounds of paper and binding, these two volumes offer entries on sixty-seven major fiction writers and make a much needed contribution to the venerable Dictionary of Literary Biography (DLB) series. If you regularly teach about or conduct research on twentieth-century Chinese literature, clear a space on your shelf for these books and ask your library to order a set for students to use. Although the combined price of these two volumes is steep—just under $700—the quality of the research and writing pays off quickly. For many users, they will prove just as useful as The Indiana Companion to Traditional Chinese Literature, Eminent Chinese of the Ch’ing Period, and more recent works such as Zhongguo jinxiandai renwu minghao da cidian. Each volume begins with an introduction by Thomas Moran that explains the historical arc of the periods covered. The second volume engages in more detail literature published in Taiwan, Hong Kong, and other areas outside of the People’s Republic. Entries for individual authors are organized alphabetically. Every essay includes a full biographical sketch, discussions of major works (often with representative long quotations), and bibliographies of original works, translations into English, and critical studies. These well-curated lists serve as a valuable starting point for research projects for readers at any level, but will be particularly helpful for advanced undergraduates and graduate students. The authors of these individual entries deserve great credit for the work found here: when virtuoso interpretation is taken to be the highest achievement of literary criticism, not all scholars learn to write the kind of clear, informative prose found throughout both books. Capturing the many sides of some of the most famous figures in modern Chinese literature requires both extensive bibliographical research and careful thought on how to portray the major issues in their works and careers. This balance is achieved admirably in the essays on writers such as Lu Xun (by Jon Eugene von Kowallis, 1: 129–150), Mao Dun (by Charles Laughlin, 1: 164–177), Zhang Ailing (by Jingyuan Zhang, 1: 296–310), and others. Other essays bring to light authors who deserve more attention. Carlos Rojas’s entry on Wumingshi (Bu Baonan), introduces a writer who, despite his extensive publications and high reputation, has gone almost entirely without mention in English-language scholarship (1: 228–234). Although I was taught to keep a healthy distance between the writer and the text (and teach my students the same), when reading the essays in this collection I find myself completely engrossed in the writers’ life stories. Todd Foley’s essay on Can Xue (Deng Xiaohua), for example, brings out the remarkable biography of one of the most adventurous and difficult writers of the late twentieth century (2: 18–28). Even the barest sketch of the first four decades of Can Xue’s life reveals an iron determination to make art: as her family was caught up in anti-Rightist actions during the Cultural Revolution, she skipped secondary school by choice and then worked as a “barefoot doctor,” ironworker, and tailor, writing on the side until she became a member of the Chinese Writer’s Association in 1988 and could finally write full-time. Her story stands in sharp contrast to the career paths of literary writers in the United States after World War II, when most fiction writers passed through university creative writing programs as students, teachers, or both. Translation also threads its way as a central theme throughout these volumes. I found myself surprised many times at the number of forgotten translations of well-known works. For example, although most scholars know Harold Shadick’s translation of Liu E’s Travels of Lao Can (Lao Can youji), it was only when I read Christopher Lupke’s essay on Liu E that I learned about earlier versions published in China, including A Tramp Doctor’s Travelogue, an English translation brought out in the 1930s by the Commercial Press, and another translation from the 1940s by none other than Yang Xianyi, who gave it the title Mr. Decadent. (A later version was published under the title Mr. Derelict—how the title went from Mr. Decadent to Mr. Derelict remains to be explained.) Each entry in the dictionary also includes a list of the author’s translations. For many young writers, including Lu Xun and his brother, Zhou Zuoren, translation presented an important way to break into publishing. 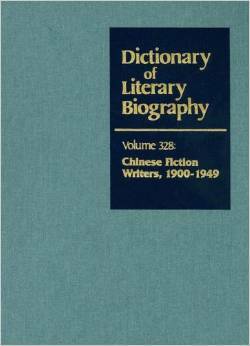 (Zhou, who is not included in the DLB, got some of his earliest publications by translating fiction under a feminine-sounding pen-name.) My sense, however, is that these bibliographies may not have the level of completeness that we might see with their original works, perhaps because these translations may have gone uncollected after an author died, were originally translated under a pen name, or were completed as work-for-hire and forgotten by everyone involved, including the author. The excellent article on Bing Xin, for example, does not mention her translation of The Prophet by Kahlil Gibran (Khalīl Jubrān), a work whose spiritual themes resonate with Bing Xin’s better-known translations of poetry and dramatic works by Rabindranath Tagore. Glancing through these entries, we also see how much work remains untranslated. Avant-garde and modernist writers like Mu Shiying and Can Xue are often very well represented in English, while the prolific and arguably much more influential writer Xiang Kairan, who “virtually invented the modern genre of the martial-arts novel based on popular lore” (1: 236) has gone completely untranslated, save for two stories in Timothy Wong’s Stories For Saturday. These omissions speak not only to the “three percent problem”—a shorthand for the appallingly small number of foreign-language books translated into English—but also the way prevailing academic standards affect who and what is translated when the main support for translation is academic institutions. Although I often agree with the collective verdict rendered by Anglophone translators about the quality of what is and what is not brought into English, it is important to note the mismatch between the information offered by the entries in this dictionary and the history that is created by translation, especially when those translations are used in the undergraduate classroom. For a book of this scope, one can always raise objections about which writers are or are not included, particularly in the second volume, which covers the latter half of the twentieth century (for a complete list of the writers included, see the table below). I will not engage in such speculation here; expert readers can always refer to the MCLC bibliography maintained by Kirk Denton. Nonetheless, I do have a few technical quibbles. The book uses no Chinese characters, not even for author’s names, although many of them can be gleaned from the black-and-white images of book covers that appear in most of the entries. The titles of non-English entries in the bibliography also go untranslated, a decision that makes this information less useful to non-specialists or to students who do not have sufficient mastery of Chinese. These volumes would also be more useful if they had been indexed. Here the DLB books do not compare as well with the Indiana Companion volumes, which have separate and very useful indices for authors, subjects, and titles. Readers who do not have space or budget for the print edition may be able to access Gale’s online version of the DLB, which includes these volumes. Unfortunately, the online version, which only offers scanned images of the original books’ two-column, 8.5-inch by 11-inch pages, is unpleasant to read because of the amount of scrolling and shifting around that is needed (unless you have an enormous computer monitor). One benefit of the online version, however, is that the text is fully searchable, which makes up somewhat for the lack of an index. For now, however, I would rather have the print versions on the shelf in my office. If the publisher were to adapt the contents to on-screen reading, such an online version would be much more attractive and would enable scholars to assemble regular updates and add new authors without producing a new printed book. Such a move to digital, however, may not be viable for the publisher. It seems that many specialist publications like the DLB will be caught choosing between expensive print editions and clunky online services until publishers find a model that makes financial sense for their authors and for themselves. Setting these technical questions aside, these two remarkable volumes also led me to wonder about the status of the “figure study” in scholarship on modern Chinese literature. After a long period where thematic studies carried the day, new books on major writers have begun to appear, reevaluating the careers of Lu Xun, Tian Han, Lin Yutang, and Chen Hengzhe, to name a few. Nonetheless, English-language biographies of other major writers, such as Lao She or Xiao Hong, have been in print for nearly forty years and would benefit from fresh takes that use new archival information and offer new ways to understand these writers’ importance for the literature of the twentieth century. Other writers, such as Wu Jianren, the author of several influential novels from the turn of the twentieth century, have never been the subject of a serious biography in any Western language. Until such works appear, scholars, teachers and students can offer their thanks to the editors and authors of these two volumes for the valuable information they will find there. See The Indiana Companion to Traditional Chinese Literature, ed. William Nienhauser, Jr. (Indianapolis: Indiana University Press, 1986); The Indiana Companion to Traditional Chinese Literature, vol. 2, ed. William Nienhauser, Jr. et al. 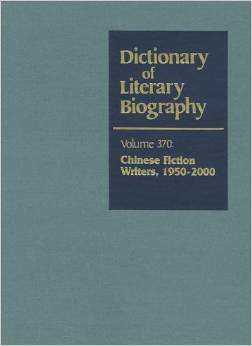 (Indianapolis: Indiana University Press, 1998); Eminent Chinese of the Ch’ing Period, ed. Arthur Hummel (1942, rpt. Taipei: SMC Publishing, 2002); and Chen Yutang 陈玉堂, Zhongguo jinxiandai renwu minghao da cidian 中国近现代人物名号大辞典 (rev. ed. Hangzhou: Zhejiang guji, 2005). See Mark McGurl, The Program Era: Postwar Fiction and the Rise of Creative Writing (Cambridge, MA: Harvard University Press, 2009). See Gloria Davies, Lu Xun’s Revolution: Writing in a Time of Violence (Cambridge: Harvard University Press, 2013); Liang Luo, The Avant-Garde and the Popular in Modern China: Tian Han and the Intersection of Performance and Politics (Ann Arbor: University of Michigan Press, 2014); Qian Suoqiao, Liberal Cosmopolitan: Lin Yutang and Middling Chinese Modernity (Leiden: Brill, 2011); Denise Gimpel, Chen Hengzhe: A Life Between Orthodoxies (Lanham, MD: Lexington Books, 2015); and Kenny Kwok-Kwan Ng, The Lost Geopoetic Horizon of Li Jieren: The Crisis of Writing Chengdu in Revolutionary China (Leiden: Brill, 2015).